The Wonder of Improvisation is available to Australian audiences via Vimeo on Demand. Click above to stream it at home, with free access to the live Q&A with Al Wunder and Director Michelle Dunn during the launch in Ballarat. This film is also available for purchase on DVD to Australian audiences. By purchasing this film, you are supporting independent film making and Michelle’s first documentary. Please note, the DVD is not closed captioned. If you are hearing impaired, please purchase the film via digital download from Amazon to access closed captions. Buy purchasing this film, you are supporting independent film making. 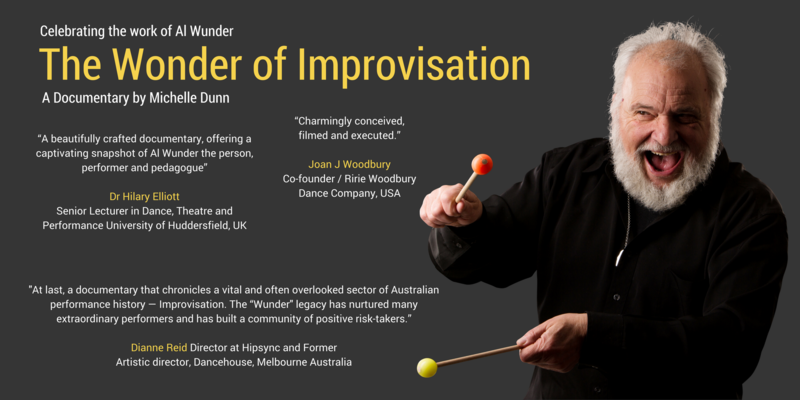 The Wonder of Improvisation is the first longer form documentary by Michelle Dunn, celebrating the legacy of Improvised movement performer and teacher Al Wunder. Affectionately known as the grandfather of Improvisation in Australia, this documentary celebrates the life and work of Al Wunder. From New York to Berkeley, then finally making his way to Melbourne, Australia, Al overcame 4 broken legs as a youth to dance in Alwin Nicholais’ company, then go on to develop his own unique form of improvised movement training. He has taught dancers, performers, artists, circus clowns and everyday people like counsellors and jail wardens around the world via his company Theatre of the Ordinary. A positive and inspiring story about performance, learning, teaching, love and a life improvised. Alison Shirley, Julianne Everleigh and Robyn Sedgwick.